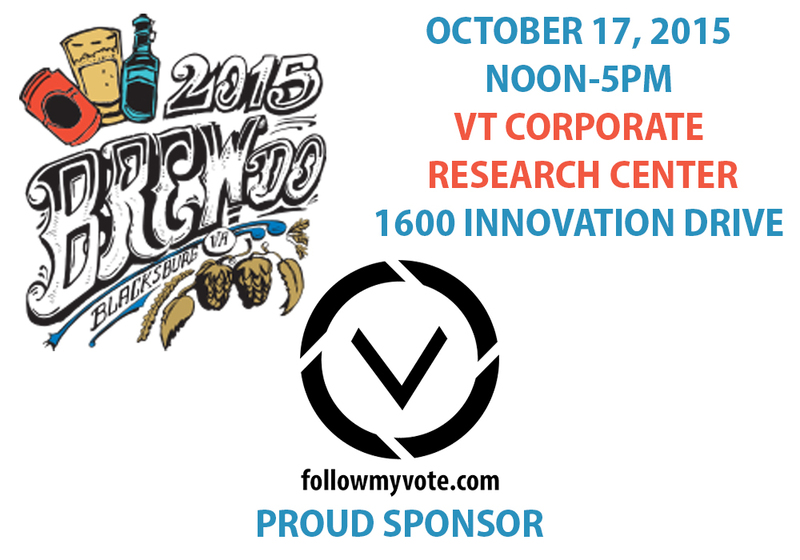 Follow My Vote is excited to be a sponsor of Blacksburg’s premier annual beer festival. The 7th annual Blacksburg Brew Do will be held this Saturday, October 17th from noon – 5 pm. Brew Do 2015 will be held at the Virginia Tech Corporate Research Center (CRC), a new and larger venue than previous years. Proceeds from the event will go to helping The Blacksburg Partnership, a local non-profit organization that helps promote and bring visitors to the area. Brew Do will offer a prime selection of the area’s best beer. Food, games, and entertainment with live music will also be offered throughout the day. Parking will not be allowed at the CRC this year, so attendees are encouraged to take advantage of Blacksburg Transit. This event truly has something to offer everyone. This year the festival welcomes back the best in craft brewers from the Mid-Atlantic region and beyond, offering another outstanding selection of ales, lagers, stouts, pilsners, ciders, and specialty beers. Delicious food, cooking and brewing demonstrations and live entertainment will compliment a great day of beer tasting. At Follow My Vote, we are big proponents of community involvement. Adam, our CEO and founder, participated in this year’s 5K Rat Race, to kickoff the first annual Virginia Cheese Festival. Multiple members of our team are Virginia Tech graduates, and we want to show our support for the Blacksburg community that has given us so much. So come share a beer with the Follow My Vote team this Saturday, and talk to us about how we can champion the cause for online voting together. The team will be handing out koozies and stickers throughout the event, so be sure to find us. We look forward to meeting you! About the author: Tyler Molihan is a Marketing Intern at Follow My Vote. He hopes to increase awareness about the benefits of online voting systems.